New York housing champion Shirley Rodriguez Remeneski has died at the age of 81. A member of the Koch, Mario Cuomo and Pataki Administrations, Mrs Remeneski passed away surrounded by her family in her home in Smithtown, NY on January 29, 2019. She is survived by her two children, Michelle Remeneski Katsch and Frankie Remeneski, seven grandchildren and a great grandchild. A Latina leader who dedicated her life to public service, Mrs Remenski created first Social Services Unit in the Bronx Borough President’s Office, under the leadership of Herman Badillo and his successor Robert Abrams. In 1971, she became the District Administrator for US Congressman Herman Badillo, managing and coordinating operations between NYC and Washington, DC. Subsequently, as part of the Koch administration, she became Assistant Deputy Mayor for affirmative action, intergovernmental relations, and community development in the South Bronx, Harlem and other underdeveloped areas in NYC. 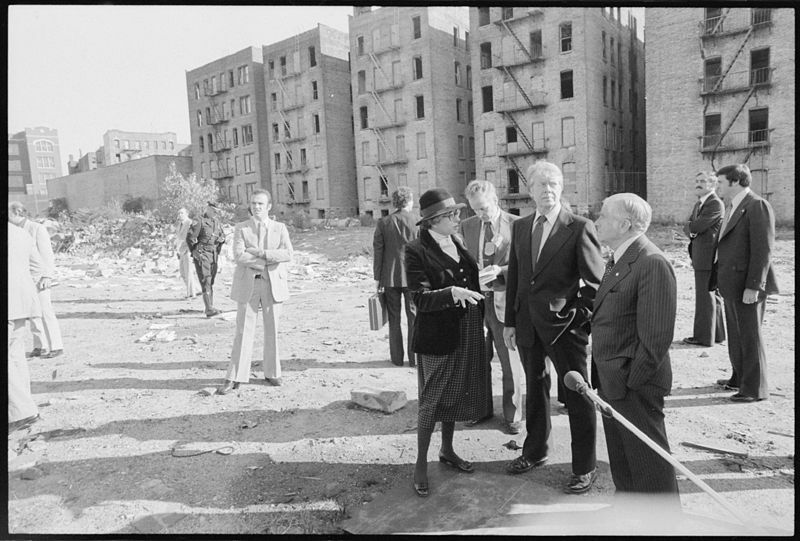 After Jimmy Carter’s visit to the South Bronx (pictured top) declaring the area the Nation’s disgrace, Mrs Remeneski went on to become the Legislative Coordinator for the South Bronx Development Organization (SBDO) securing federal funding to create the South Bronx Job Corps Center, land revitalization projects and securing the South Bronx Empowerment Zone to support private business development and housing assistance. In 1986, she assumed the position of Executive Director of Governor Mario Cuomo’s Office for Hispanic Affairs and later served as Deputy Commissioner and Equal Employment Opportunity Officer for the NYC Department of Housing Preservation and Development. In 2002, Governor Pataki appointed her Senior Vice President at the Empire State Development Corporation’s Economic Development Division. Among the many of the professional and civic endeavors Mrs Remenseki was involved with, she founded the 100 Hispanic Women, Inc. in 1996 with a group of dynamic and professional Latina women, committed to empowering Latinas through scholarship and mentoring programs. In recognition of her tireless efforts, she was the recipient of countless awards from the US House of Representatives; the NYS Senate; the NY Knicks; the Puerto Rican Bar Association; Verizon; the United Bronx Organization; El Diario; Governor Pataki; the Girl Scouts; the Hispanic Society; NY & NJ Port Authority; the NYS Department of Correctional Services and Hispanic Magazine. Funeral services are being held today in the Bronx.